Includes: animatronic, adapter, instruction manual. Dimensions: 30. 5â h x 18â w x 19â d.
Some things are better left untouched, and this frozen corpse may just be one of them. 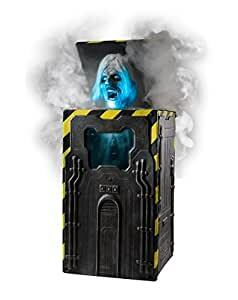 Donât get too close to this suspicious-looking chamber, or else youâll see the red lights begin to flash in warningâand then the corpse will pop out from the top of the chamber! You can control whether the light turns green or blue to set the perfect mood for your haunted house.